John Spicer netted a second-half winner as Notts County beat Plymouth in the first round of the Carling Cup. It was stalemate at half-time, with Bradley Wright-Phillips going closest to opening the scoring but he fired wide from eight yards. Spicer was on hand to put the visitors ahead on 52 minutes, picking up a loose ball and edging it past Romain Larrieu. Argyle substitute Steve MacLean forced a superb save from Stuart Nelson late on but County held to their lead. "We were a bit anxious and gave away too many free kicks for my liking, a little bit of rash, naive football. "We had chances, but sometimes at home you need to be a bit patient on the ball and we just went a bit long in certain ways. "Sometimes you've got to play football with your head and we didn't do that too well tonight." "We played some good football and had some energy about us. "I thought we got bullied a little bit on Saturday against Huddersfield but we didn't get that today. "I am really proud of them. Today we showed what we're like and I'm chuffed to bits with them." 90:00+4:46 Goal kick taken long by Stuart Nelson (Notts County). 90:00+4:10 Defending throw-in by Kari Arnason (Plymouth). 90:00+3:19 Foul by Reda Johnson (Plymouth) on Stephen Hunt (Notts County). Direct free kick taken right-footed by Liam Chilvers (Notts County) from right channel, resulting in open play. 90:00+2:39 Goal kick taken long by Stuart Nelson (Notts County). 90:00+2:19 Shot by Craig Noone (Plymouth) left-footed from centre of penalty area (18 yards), over the bar. 90:00+1:58 Jake Jervis (Notts County) caught offside. Indirect free kick taken left-footed by Romain Larrieu (Plymouth) from own half, resulting in open play. 90:00+1:39 Attacking throw-in by Krystian Pearce (Notts County). 90:00+0:22 Jake Jervis (Notts County) caught offside. Indirect free kick taken left-footed by Romain Larrieu (Plymouth) from own half, resulting in open play. 90:00+0:07 Foul by Chris Clark (Plymouth) on Neal Bishop (Notts County). Direct free kick taken right-footed by Richard Ravenhill (Notts County) from own half, resulting in open play. 89:33 Defending throw-in by Jon Harley (Notts County). 89:06 Goal kick taken long by Romain Larrieu (Plymouth). 88:52 Shot by Craig Westcarr (Notts County) right-footed from right channel (25 yards), over the bar. 88:04 Foul by Reda Johnson (Plymouth) on Richard Ravenhill (Notts County). Free kick taken right-footed by Jake Jervis (Notts County) from left channel (35 yards), clearance by Karl Duguid (Plymouth). 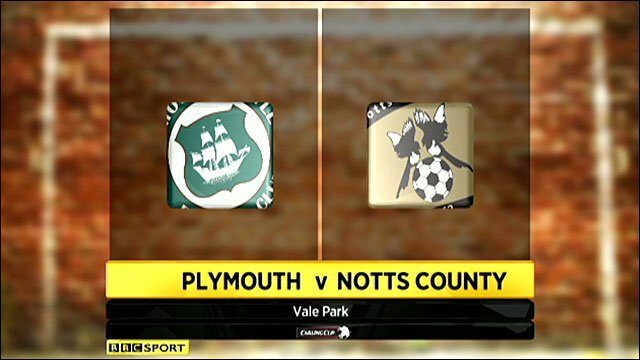 87:45 Shot by Neal Bishop (Notts County) left-footed from left channel (30 yards), blocked by Curtis Nelson (Plymouth). 87:10 Defending throw-in by Krystian Pearce (Notts County). 86:41 Attacking throw-in by Karl Duguid (Plymouth). 85:28 Foul by Richard Ravenhill (Notts County) on Curtis Nelson (Plymouth). Direct free kick taken right-footed by Kari Arnason (Plymouth) from own half, passed. 85:10 Goal kick taken long by Romain Larrieu (Plymouth). 84:52 Shot by Steven MacLean (Plymouth) right-footed from left side of penalty area (18 yards), missed left. 84:25 Attacking throw-in by Kari Arnason (Plymouth). 83:03 Direct free kick taken left-footed by Richard Ravenhill (Notts County) from right channel, passed. 83:03 Substitution Notts County substitution: Ben Davies replaced by Stephen Hunt (tactical). 83:03 Foul by Curtis Nelson (Plymouth) on Kevin Smith (Notts County). 82:26 Defending throw-in by James Paterson (Plymouth). 81:31 Direct free kick taken left-footed by Jon Harley (Notts County) from own half, resulting in open play. 81:31 Booking Steven MacLean (Plymouth) booked for unsporting behaviour. 81:31 Foul by Steven MacLean (Plymouth) on Liam Chilvers (Notts County). 79:47 Outswinging corner from left by-line taken left-footed by Craig Noone (Plymouth) to near post, header by Kari Arnason (Plymouth) from left side of six-yard box (6 yards), missed left. Goal kick taken long by Stuart Nelson (Notts County). 79:25 Defending throw-in by Karl Duguid (Plymouth). 78:30 Direct free kick taken right-footed by Stuart Nelson (Notts County) from own half, resulting in open play. 78:30 Booking Curtis Nelson (Plymouth) booked for dissent. 78:30 Foul by Curtis Nelson (Plymouth) on Richard Ravenhill (Notts County). 77:30 Attacking throw-in by James Paterson (Plymouth). 75:44 Foul by Chris Clark (Plymouth) on Neal Bishop (Notts County). Direct free kick taken left-footed by Jon Harley (Notts County) from own half, resulting in open play. 75:33 Goal kick taken long by Romain Larrieu (Plymouth). 74:58 Shot by Steven MacLean (Plymouth) right-footed from centre of penalty area (18 yards), save (caught) by Stuart Nelson (Notts County). 74:08 Substitution Plymouth substitution: Rory Fallon replaced by Steven MacLean (tactical). 72:56 Inswinging corner from right by-line taken left-footed by Craig Noone (Plymouth) to near post, clearance by Richard Ravenhill (Notts County). 71:55 Attacking throw-in by James Paterson (Plymouth).Attacking throw-in by James Paterson (Plymouth). 71:46 Jake Jervis (Notts County) caught offside. Direct free kick taken left-footed by Romain Larrieu (Plymouth) from own half, resulting in open play. 70:40 Attacking throw-in by Jon Harley (Notts County). 70:08 Substitution Notts County substitution: John Spicer replaced by Kevin Smith (tactical). 69:43 Attacking throw-in by Karl Duguid (Plymouth). 69:20 Defending throw-in by James Paterson (Plymouth). 68:37 Attacking throw-in by Krystian Pearce (Notts County). 68:24 Attacking throw-in by Krystian Pearce (Notts County). 67:32 Goal kick taken long by Stuart Nelson (Notts County). 67:06 Booking Ben Davies (Notts County) booked for unsporting behaviour. 66:19 Booking John Spicer (Notts County) booked for unsporting behaviour. 66:19 Foul by John Spicer (Notts County) on James Paterson (Plymouth). Direct free kick taken left-footed by James Paterson (Plymouth) from left wing, passed. 66:13 Attacking throw-in by Craig Westcarr (Notts County). 64:39 Free kick crossed right-footed by Ben Davies (Notts County) from right wing, clearance by Reda Johnson (Plymouth). 64:39 Substitution Plymouth substitution: Anton Peterlin replaced by Curtis Nelson (tactical). 64:39 Booking Craig Noone (Plymouth) booked for unsporting behaviour. 64:39 Foul by Craig Noone (Plymouth) on Craig Westcarr (Notts County). 64:30 Defending throw-in by James Paterson (Plymouth). 64:04 Foul by Bradley Wright-Phillips (Plymouth) on Richard Ravenhill (Notts County). Direct free kick taken right-footed by Richard Ravenhill (Notts County) from right channel, passed. 63:20 Defending throw-in by James Paterson (Plymouth). 62:00 Goal kick taken long by Romain Larrieu (Plymouth). 61:39 Attacking throw-in by Jon Harley (Notts County). 60:42 Defending throw-in by Krystian Pearce (Notts County). 59:08 Foul by Reda Johnson (Plymouth) on Neal Bishop (Notts County). Free kick crossed right-footed by Ben Davies (Notts County) from left wing, save (punched) by Romain Larrieu (Plymouth). Corner from right by-line taken short right-footed by Ben Davies (Notts County). 58:27 Attacking throw-in by James Paterson (Plymouth). 58:01 Foul by Mike Edwards (Notts County) on Bradley Wright-Phillips (Plymouth). Direct free kick taken right-footed by Anton Peterlin (Plymouth) from right channel, passed. 57:48 Goal kick taken long by Stuart Nelson (Notts County). 57:29 Cross by Craig Noone (Plymouth), header by Onismor Bhasera (Plymouth) from centre of penalty area (12 yards), missed right. 56:40 Attacking throw-in by Kari Arnason (Plymouth). 55:53 Foul by Mike Edwards (Notts County) on Bradley Wright-Phillips (Plymouth). Direct free kick taken left-footed by Onismor Bhasera (Plymouth) from right channel, resulting in open play. 53:41 Goal kick taken long by Romain Larrieu (Plymouth). 53:36 Attacking throw-in by Krystian Pearce (Notts County). 53:05 Substitution Notts County substitution: Ben Burgess replaced by Jake Jervis (tactical). 52:37 Defending throw-in by Karl Duguid (Plymouth). 51:17 GOAL - John Spicer:Plymouth 0 - 1 Notts County Goal by John Spicer (Notts County) left-footed (top-left of goal) from centre of penalty area (18 yards).Plymouth 0-1 Notts County. 50:59 Defending throw-in by Karl Duguid (Plymouth). 50:03 Defending throw-in by Krystian Pearce (Notts County). 49:47 Cross by Craig Noone (Plymouth), clearance by Mike Edwards (Notts County). 49:17 Attacking throw-in by Krystian Pearce (Notts County). 48:09 Foul by Kari Arnason (Plymouth) on Ben Burgess (Notts County). Free kick taken right-footed by Ben Davies (Notts County) from left channel (25 yards), hit wall. 47:51 Ben Burgess (Notts County) caught offside. Indirect free kick taken right-footed by Reda Johnson (Plymouth) from own half, passed. 46:57 Inswinging corner from right by-line taken left-footed by Craig Noone (Plymouth) to far post, shot by Rory Fallon (Plymouth) volleyed left-footed from left side of six-yard box (6 yards), missed left. Goal kick taken long by Stuart Nelson (Notts County). 45:33 Attacking throw-in by Krystian Pearce (Notts County). 45:01 Substitution Plymouth substitution: Lee Molyneux replaced by James Paterson (tactical). 45:00+0:37 Foul by Ben Burgess (Notts County) on Kari Arnason (Plymouth). Direct free kick taken left-footed by Romain Larrieu (Plymouth) from own half, resulting in open play. 44:52 Shot by Craig Westcarr (Notts County) right-footed from centre of penalty area (18 yards), blocked by Reda Johnson (Plymouth). 43:28 Shot by Craig Noone (Plymouth) left-footed from right channel (25 yards), missed left. Goal kick taken long by Stuart Nelson (Notts County). 42:13 Foul by Karl Duguid (Plymouth) on Ben Davies (Notts County). Free kick crossed right-footed by Ben Davies (Notts County) from left by-line, save (caught) by Romain Larrieu (Plymouth). 42:07 Attacking throw-in by Jon Harley (Notts County). 40:57 Foul by Mike Edwards (Notts County) on Rory Fallon (Plymouth). Direct free kick taken left-footed by Craig Noone (Plymouth) from right channel, resulting in open play. 40:32 Goal kick taken long by Romain Larrieu (Plymouth). 40:19 Shot by Ben Davies (Notts County) right-footed from left side of penalty area (18 yards), over the bar. 38:41 Foul by Anton Peterlin (Plymouth) on Neal Bishop (Notts County). Free kick crossed right-footed by Ben Davies (Notts County) from right wing, clearance by Rory Fallon (Plymouth). Inswinging corner from left by-line taken right-footed by Ben Davies (Notts County) to far post, clearance by Rory Fallon (Plymouth). 38:36 Defending throw-in by Lee Molyneux (Plymouth). 38:06 Foul by Lee Molyneux (Plymouth) on Neal Bishop (Notts County). Direct free kick taken right-footed by Neal Bishop (Notts County) from right channel, passed. 36:57 Goal kick taken long by Stuart Nelson (Notts County). 36:21 Attacking throw-in by Karl Duguid (Plymouth). 35:38 Goal kick taken long by Romain Larrieu (Plymouth). 33:28 Foul by Kari Arnason (Plymouth) on Ben Burgess (Notts County). Free kick taken right-footed by Ben Davies (Notts County) curled from left channel (25 yards), over the bar. Goal kick taken long by Romain Larrieu (Plymouth). 33:18 Attacking throw-in by Jon Harley (Notts County). 33:13 Attacking throw-in by Jon Harley (Notts County). 31:55 Shot by Onismor Bhasera (Plymouth) left-footed from centre of penalty area (18 yards), blocked by Neal Bishop (Notts County). Shot by Anton Peterlin (Plymouth) left-footed from left channel (20 yards), missed right. Goal kick taken long by Stuart Nelson (Notts County). 31:14 Goal kick taken long by Romain Larrieu (Plymouth). 28:41 Defending throw-in by Lee Molyneux (Plymouth). 28:35 Defending throw-in by Lee Molyneux (Plymouth). 26:28 Foul by Rory Fallon (Plymouth) on Mike Edwards (Notts County). Direct free kick taken right-footed by Stuart Nelson (Notts County) from own half, resulting in open play. 26:08 Goal kick taken long by Romain Larrieu (Plymouth). 25:30 Defending throw-in by Lee Molyneux (Plymouth).Attacking throw-in by Krystian Pearce (Notts County). 24:28 Goal kick taken long by Stuart Nelson (Notts County). 23:33 Attacking throw-in by Anton Peterlin (Plymouth). 22:45 Foul by Liam Chilvers (Notts County) on Rory Fallon (Plymouth). Free kick crossed left-footed by Craig Noone (Plymouth) from left channel, clearance by Mike Edwards (Notts County). 22:08 Rory Fallon (Plymouth) caught offside. Indirect free kick taken right-footed by Stuart Nelson (Notts County) from own half, resulting in open play. 20:43 Attacking throw-in by Karl Duguid (Plymouth). 20:38 Defending throw-in by Karl Duguid (Plymouth). 19:53 Foul by Rory Fallon (Plymouth) on Krystian Pearce (Notts County). Direct free kick taken right-footed by Stuart Nelson (Notts County) from own half, resulting in open play. 18:44 Handball by Ben Davies (Notts County). Direct free kick taken right-footed by Anton Peterlin (Plymouth) from own half, passed. 17:15 Cross by Chris Clark (Plymouth), resulting in ball out of play. Goal kick taken long by Stuart Nelson (Notts County). 16:40 Defending throw-in by Jon Harley (Notts County). 16:17 Attacking throw-in by Kari Arnason (Plymouth). 15:08 Attacking throw-in by Kari Arnason (Plymouth). 14:27 Ben Burgess (Notts County) caught offside. Indirect free kick taken left-footed by Romain Larrieu (Plymouth) from own half, resulting in open play. 14:08 Foul by Bradley Wright-Phillips (Plymouth) on Krystian Pearce (Notts County). Direct free kick taken right-footed by Stuart Nelson (Notts County) from own half, resulting in open play. 10:09 Shot by Bradley Wright-Phillips (Plymouth) volleyed left-footed from centre of penalty area (12 yards), missed right. Goal kick taken long by Stuart Nelson (Notts County). 7:34 Foul by Anton Peterlin (Plymouth) on Ben Davies (Notts County). Free kick taken right-footed by Ben Davies (Notts County) curled from left channel (25 yards), over the bar. Goal kick taken long by Romain Larrieu (Plymouth). 6:36 Foul by John Spicer (Notts County) on Karl Duguid (Plymouth). Direct free kick taken left-footed by Romain Larrieu (Plymouth) from own half, resulting in open play. 5:10 Foul by Kari Arnason (Plymouth) on Ben Burgess (Notts County). Free kick crossed right-footed by Ben Davies (Notts County) from left channel, save (caught) by Romain Larrieu (Plymouth). 4:21 Shot by Craig Noone (Plymouth) curled left-footed from right channel (25 yards), over the bar. Goal kick taken long by Stuart Nelson (Notts County). 2:57 Defending throw-in by Krystian Pearce (Notts County). 2:28 Defending throw-in by Lee Molyneux (Plymouth). 2:11 Attacking throw-in by Krystian Pearce (Notts County). 1:00 Shot by Onismor Bhasera (Plymouth) left-footed from left channel (25 yards), blocked by Krystian Pearce (Notts County).